Chaos Trip Studios has released the first in their D&D 4.0 adventure series that they're calling Slayers of the Great Serpent. Chaos Trip Studios is proud to announce the release of the first installment of our fantasy adventure series, Slayers of the Great Serpent. “To the Ede of the Map” is the first installment of a classic fantasy adventure series called Slayers of the Great Serpent. The story begins when a messenger arrives at the royal court with a warning of apocalyptic magnitude. A terrible menace that is about to awaken; heroes are needed to cross the ocean and travel to the distant East in order to search for the lair of a gargantuan snake known as The Destroyer and The Eater of Worlds. These heroes must travel far from their homes, and try to find the country where the Great Serpent lives. Very little is known about this land, save for rumors that it lies to the east of distant Xi, a strange and romantic kingdom on the other side of the ocean. Nothing will be certain on this journey, not the final destination of our heroes, or the incredible dangers that they are sure to face. If no one can find this monster and lay it low before it rises from its torpor then the world will fall into an age of darkness and become transformed into a nightmarish hellscape of misery and death. 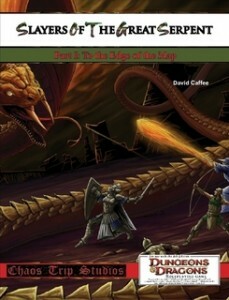 An adventure for Dungeons and Dragons 4th Edition that takes the characters from 1st to 4th level.